Inveraray Castle is a castle in western Scotland. 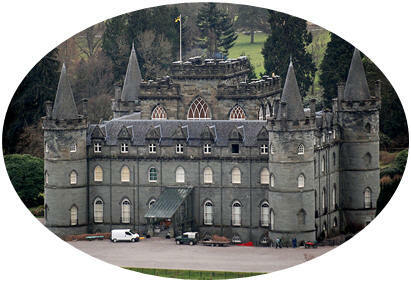 It is the seat of the Chief of Clan Campbell, the Duke of Argyll. The initial design for the castle was made in 1720 by the architect Sir John Vanbrugh, who also designed Blenheim Palace. This design was later developed by the architects Roger Morris and William Adam, who oversaw the beginning of the castle's construction in 1746, commissioned by Archibald Campbell, 3rd Duke of Argyll. It was completed in 1789 for John Campbell, 5th Duke of Argyll and his wife, Elizabeth. Built in an eclectic mixture of architectural revival styles, it stands on the original site of the village of Inveraray - when Archibald Campbell decided to build the castle he had the village demolished and rebuilt a mile away, so that it would not impinge on the castle's outlook. Incorporating Baroque, Palladian and Gothic architectural features, the castle layout is square with four round, castellated towers at each corner, each of which bears a conical spire. It is surrounded by 2 acres of formal gardens and 14 acres (57,000 m2) of parkland and lies around a mile north of the village of Inveraray, near the shore of Loch Fyne in Argyll and Bute. The castle was damaged by two major fires, in 1877 and 1975, but most of its important artifacts and features survived or have been restored. It contains outstanding furnishings and interiors from the 18th and 19th centuries. The elaborate decoration of the castle's State Dining Room, completed in 1784, is the only surviving work of the French painters Girard and Guinard, who were also commissioned by the then Prince of Wales (later George IV) to decorate his London residence, Carlton House. The Armoury Hall, which contains a display of wall-mounted weapons dating from around 1740, has the highest ceiling in Scotland ( nearly 69 feet). Inveraray Castle is the home of the current duke (Torquhil Campbell, 13th Duke of Argyll) and his family, but its distinctive appearance, beautiful interiors and attractive setting make it a popular tourist attraction, and it is open to visitors at certain times of the year.